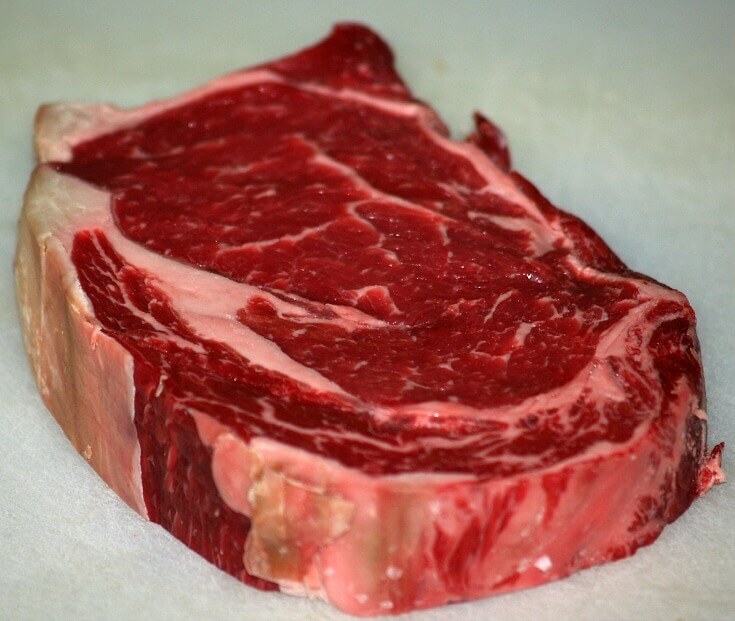 When learning how to cook ribeye steak let us first look at from where this steak comes. As the name suggest, it is taken from the rib section of the beef. The “eye” denotes that it came from the center and best part of the rib steak. The Delmonico Restaurant in New York made the rib eye steak popular to many by their creation of the Delmonico steak. Appearing like a filet mignon, two hearts of rib eye steaks are attached together , cooked and served in a the famous presentation of this also famous restaurant. Since this steak is one of my favorites, I learned how to cook ribeye steak early in my adult life. Some countries serve this cut with a bone in but here in the United States it is served boneless. I prefer this steak over others because of the delicious flavor and tenderness. The great flavor comes from the marbling of the fat through the meat. Because of the lightly worked area of the upper rib cage the meat is very tender. How to cook ribeye steak is an easy question to answer. Because of the steaks tenderness, it is suitable for all types of cooking. Slow cooking is good but for me I love the flavor and texture when they are quick cooked. Quick browning in the skillet and broiling are great but you cannot beat grilling over hot flames. Some might like to add flavors other than what is obtained by simply cooking. This seasoning might be as simple as sprinkling with salt and pepper. Other seasoning might be accomplished with steak rubs and marinades. Because the rib eye steak is a naturally tender cut of steak you will want to use the rubs and marinades only for seasoning. This means to avoid those made up with acidic bases like juices, vinegars, wines and other alcohols. If you do use these for flavor only let them marinate only a short while otherwise the acid will “chew” up the fibers making the steak fall apart. 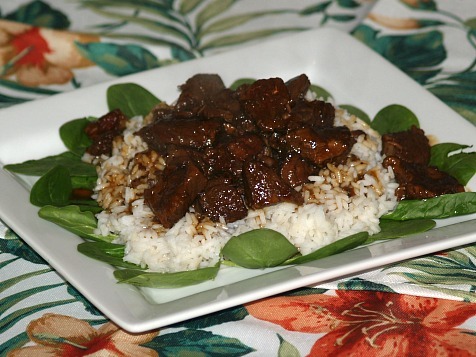 Heat oil in a deep heavy skillet or Dutch oven; quickly brown steak. Add green onions and garlic and fry quickly; add remaining ingredients. Bring mixture to a boil; reduce heat, cover and simmer for a couple hours until meat is tender. Before serving thicken juices with a little flour or cornstarch; serve over rice. 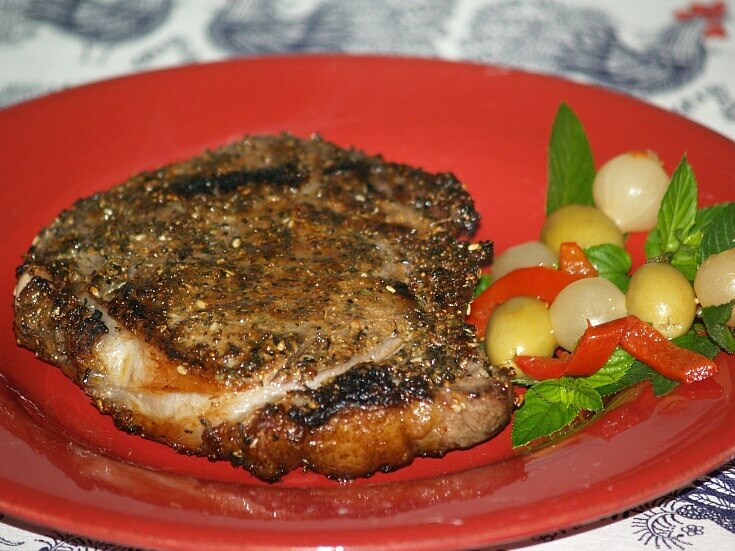 Learn how to cook ribeye steaks that are simply delicious! Place steaks in large zip lock plastic bag. Combine wine, olive oil, lemon juice and seasonings in bowl; blend well. Pour wine mixture in bag over the steaks; turn bag over to cover steaks well. Marinate for 2 hours in refrigerator turning frequently. Place on hot grill or under hot broiler until desired doneness. Enough for 4 to 6 BUT STEAKEATERS will love their own! Learn how to cook ribeye steak with this flavorful recipe. Combine and blend salt, black pepper, garlic, cayenne, lemon pepper, parsley and thyme. Brush the steaks on both sides with oil; rub seasoning mixture into steaks. Place on hot grill or broil until desired doneness (Around 10 minutes on each side). Serve 2 to 4 depending on pounds of meat and appetites. When you learn how to cook ribeye steak this could make a great presentation for guests. With a meat mallet on a cutting board pound the steaks until they are about ¼ inch thick. Sprinkle each side of steaks with salt and pepper and pound it in. In a Dutch oven brown each steak on both sides in hot melted butter. Pour brandy over the steaks; CAREFULLY set the brandy aflame with a long match. When the flaming stops stir in the shallots and chives; cook about 1 minute. Add the sherry and heat thoroughly. 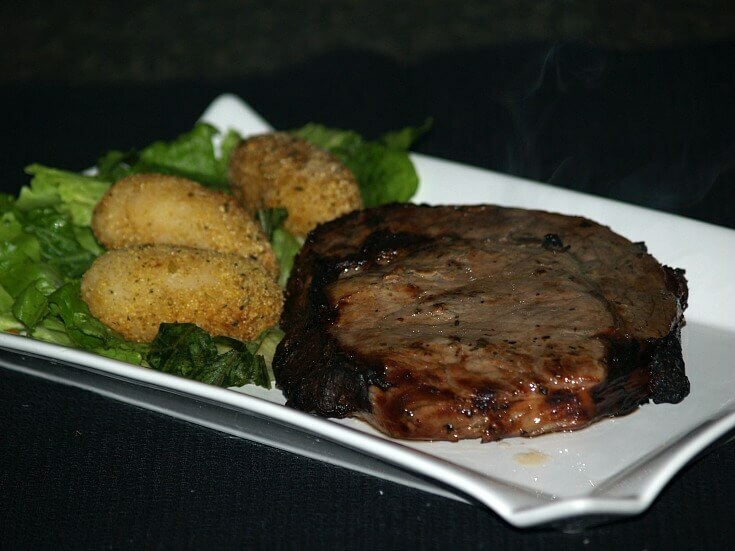 Place steaks on serving platter and spoon sherry juices over the steaks; keep warm until serving. When learning how to cook ribeye steak try this recipe. It is also great for other types of beef particularly sirloin steaks. Heat the oil in a large skillet to very hot; brown steaks on both sides. Turn the heat down and cook steaks until done to your taste. Drain the meat and place on a platter; season with the salt and pepper and keep warm. Add the garlic to the meat juices in the skillet; cook until golden brown. Add the sliced tomatoes and oregano (More salt and pepper if desired). Cook about 8 minutes; return steaks and any juices on platter to the pan. Cook a few seconds and serve steak on platter; spoon tomato sauce over steaks. When learning how to cook ribeye steak you will find great tasting recipes made with sauces. This classic French sauce recipe is delicious served over grilled rib eye steaks, other cuts of steak or even other meats like pork. This famous sauce is named after the Bordeaux region of France which is famous for its wines. Besides wine it utilizes the marrow from beef bones. (Not common here in the United States). In some countries like France butchers will sell the bone marrow by the ounce or pound or they might sell you the bones estimating how much marrow will be in the bones. If you do purchase the bones with the marrow inside, let the bones set to room temperature before scooping the marrow out. This delicious recipe has been around since way back in the eighteen hundreds so it is worth trying. Cube beef marrow and simmer in water 2 minutes; drain and set aside. Brown steaks on both sides in 1 tablespoon butter in a skillet over high heat. Remove all but 2 tablespoons of fat from the first skillet. Add shallots, red wine and peppercorns to the fat; cook and reduce by two thirds. Blend the arrowroot with 3 tablespoons of the cold veal stock. Heat remaining veal stock in a small saucepan; stir the arrowroot mixture in the hot stock. Cook hot stock over low heat stirring until mixture thickens about 5 minutes. Remove thickened mixture off the heat and stir in the Madeira wine. Strain the red wine shallot mixture through a strainer. Add the strained mixture red wine mixture into the thickened stock. Bring the sauce to a boil and add the cooked marrow cubes. Remove sauce from the heat; spoon sauce over steaks to serve. Brush steaks with oil; sprinkle generously with pepper and let stand for 15 minutes. Slash edge at 3 inch intervals to prevent curling. Brush barbeque grill with olive oil; place steaks on hot grill about 6 inches from heat. Cook steaks 4 to 6 minutes on each side (Or until desired doneness) turning one time. Serve with lemon wedge to squeeze over top. 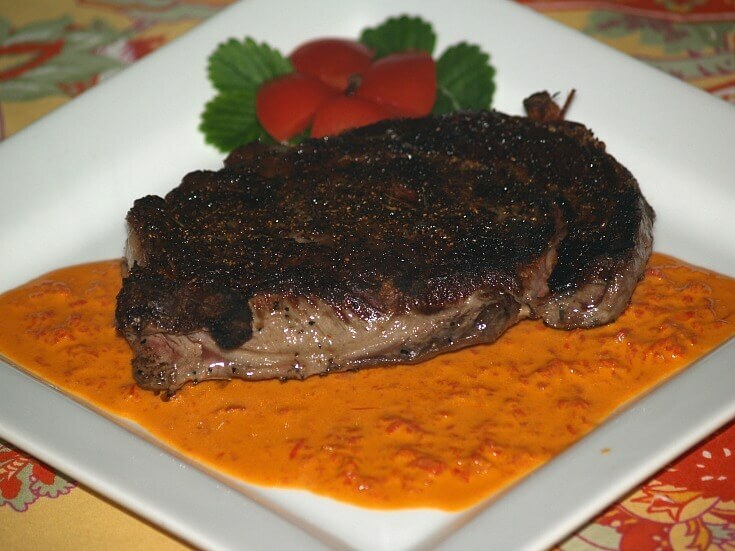 Learn how to cook ribeye steak with a delicious red pepper saffron cream sauce. Sprinkle salt on both sides of steaks; let stand 10 minutes. Combine pepper, thyme, rosemary and garlic powder; rub mixture on both sides of steaks. Add steaks to skillet; REDUCE HEAT and cook steaks 4 minutes on each side or to desired doneness. Serve with red pepper saffron cream sauce. When learning how to cook ribeye steak or other steaks, you will love this sauce recipe to serve with them. Combine pimiento, broth, whipping cream and saffron in a small saucepan. Bring mixture to a boil; REDUCE HEAT, simmer uncovered until mixture is reduced by half. Cool mixture slightly; pour into blender or food processor. Add lemon juice; process until smooth and serve. Combine first 6 ingredients; beat with mixer until smooth. Spread a thin layer over top of each steak. Place steaks on lightly greased broiler pan rack. Broil 4 to 6 minutes on each side (4 Inches from heat source).